Get up to $8000 in Bonuses from Welcome Package! Use Code = "BOVEGAS250"
Get 250% Slots Match + 35 Free Spins on Stardust. Use Code = "JUNGLEFAIRY"
Get 210% Slots Match + 35 FREE Spins on Lucha Libre 2! Use Code = "TACOMALO"
Get 230% Match Bonus + 25 FREE Spins on Eagle Shadow Fist. Use Code = "SHADOWFIGHT"
Get 225 Match Bonus + 30 FREE Spins on Shanghai Nights! Use Code = "NIGHTLIGHTS"
Get 125% Match Bonus on Cards! Use Code = "BREEZY"
Get 125% Match Bonus on Cards! Use Code = "CARDSINVEGAS"
Get 100% Roulette Match Bonus! Use Code = "ROULETTE"
Those in search of a Realtime Gaming casino offering a fabulous selection of games, fee-free withdrawals, and exciting promotions will want to take a look at BoVegas. 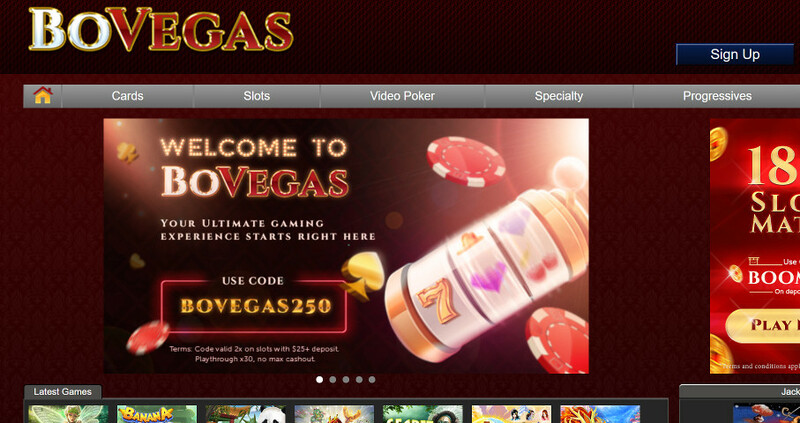 While this site’s name bears a passing resemblance to the familiar “Bovada,” there is no relation between the two. BoVegas is owned by a different company and is an entirely unrelated site. Let’s take a look at what they have to offer. In this area, however, I can clear up a little confusion from my research. There are rumors (rather negative ones) that BoVegas is owned and operated by a company called Blue Media N.V. This however does not appear to be the case. Actually, there are no details on the matter there at all, so I will assume for the time being that this site is unregulated (a license number is the sort of thing one tends to display prominently on one’s website). Perhaps they are still working on getting their license. In any case, we will update this section with further information when we learn more. Can You Play at BoVegas From the USA? Yes, absolutely! BoVegas has very few geographical restrictions. The only prohibited countries are Costa Rica, Ukraine, Israel, and Belarus. 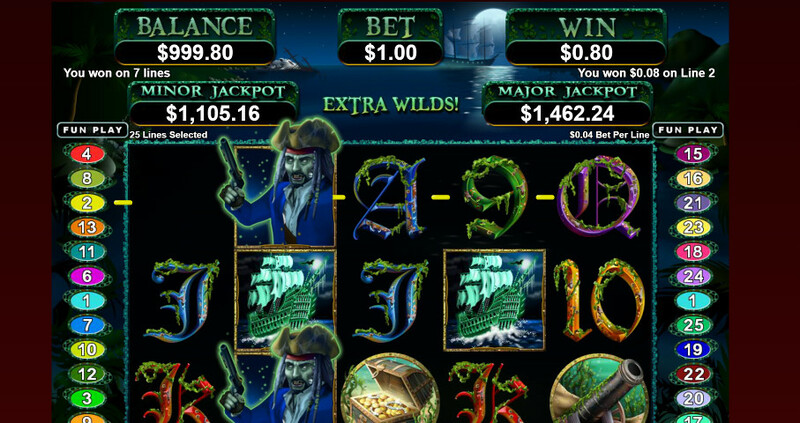 All of the latest Slots are waiting for you. Promotions offered by BoVegas can be separated into four categories: Welcome Bonuses, Daily Rewards, Monthly Specials, and the VIP Campaign. To give you a taste of the types of bonuses you can enjoy, here is what is on offer as of the time of this writing in each category. 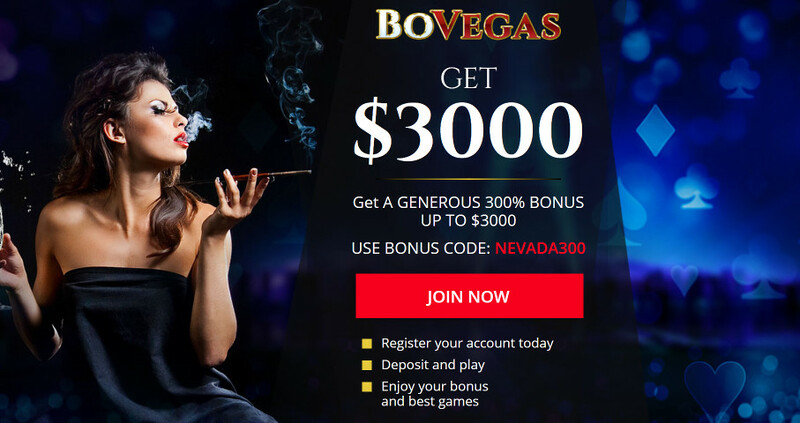 Currently, there are up to $5,500 welcome bonuses you can claim at BoVegas. These are available in the form of slots match bonuses of 250% and 300%. Bonuses are valid for all Slot games, Keno, Bingo and Scratch cards. Wagering will get you a match bonus, Slots have a 30x playthrough. Restricted countries: Israel, Russian Federation, Poland, India, Ukraine, Belarus, Malaysia and Costa Rica. Today is Wednesday, so when I go on the site, it displays the daily rewards for Wednesdays. If you deposit $105 or more, you can get a match bonus of up to 170% as well as 30 free spins. Each day of the week, you can check the daily promotions to see what is available. There is a series of monthly specials available with match bonuses of different amounts depending on how much you deposit. So for example, if you deposit $25 or more, you can get a match bonus of 105% and 25 free spins. 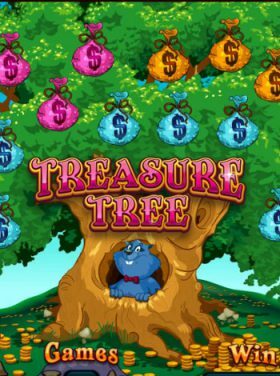 Deposit $75 or more, and you get a match of 140% and 35 free spins. The more you deposit, the more rewards you can qualify for. For some more of our honest Online Casino reviews you can click here. Also be sure to learn more about some of our favorite Sportsbooks. The higher your tier, the more exciting rewards you can get. At the lowest level (Play Knight), you receive a $75 Status Recognition Chip and are awarded comp points as you play as well as 15% cash-back every week. A personal manager is assigned to your account, and you are given a $50 bonus to celebrate your birthday. When new games come out, you can qualify for special match bonuses when you play them. At the highest tier (Vegas Legend), you are given a $1,000 Luxurious Status Reward Chip. Along with higher cash-back and table limits, you get some cool added benefits like 10% insurance, High Roller Rewards, and invitations to exclusive slot tournaments. For match bonuses, there is a rollover requirement which may range from 30-60x, depending on the types of games the bonus is for. There are specific terms and conditions for each type of bonus offered by the casino (no-deposit bonuses, free spins, etc. ), so you should read through them with care before accepting promotional offers. 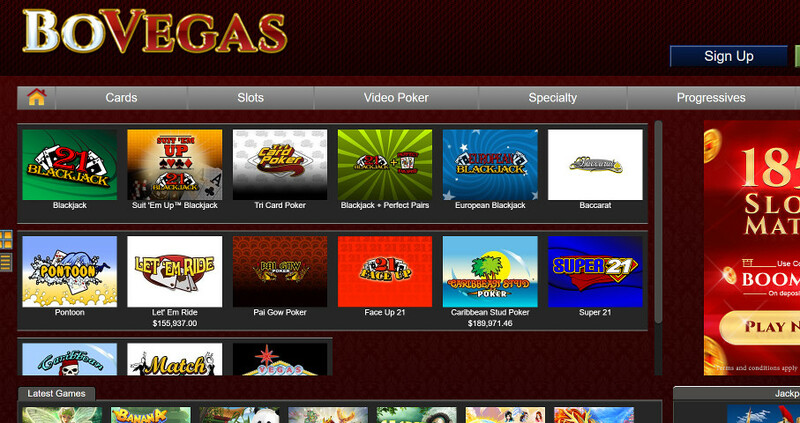 There are two ways to play at BoVegas: online through your web browser, or by downloading the casino software. 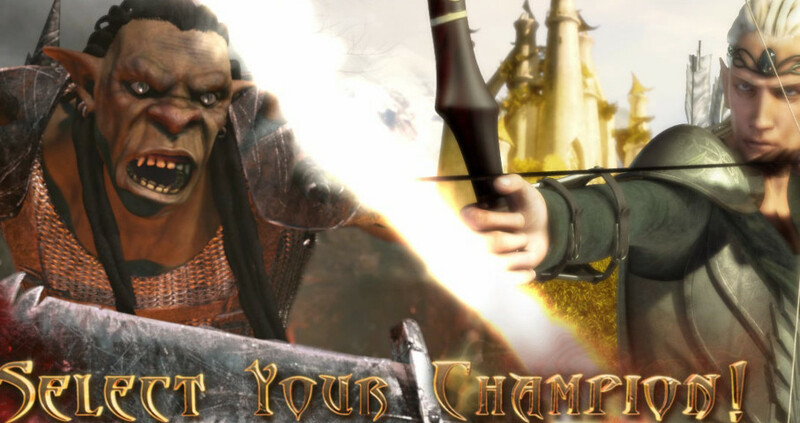 You can only download software to play on a Windows or Android device (laptop, PC or mobile). If you are on a different operating system, you can still play, but you will have to use the web interface. 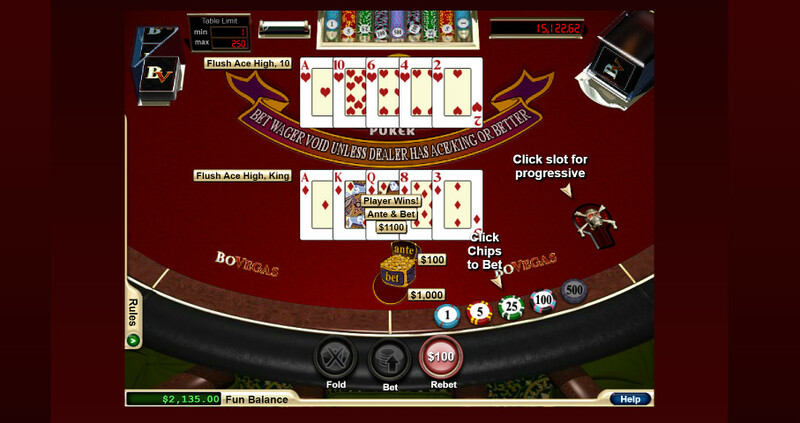 Bored with regular Casino Games? Try your luck at some good old fashioned ‘scratchers’. You’ll find plenty here to keep you entertained for endless hours. And if you’re lucky, hopefully you’ll win a few jackpots along the way. For all of these methods, the minimum deposit amount is just $25. The maximum is $1,000 for all methods except for bitcoin, which has no maximum cap. The minimum amount you can withdraw is $100. I prefer more flexibility in this regard, but this is not unexpected with online casinos. The maximum amount is also capped at $2,000. In some situations, that may be a bit restrictive as well. You can only request a single payout per week. In terms of processing time, the site takes care of payments during weekdays only, and generally takes 3-7 days to do so. So you should plan ahead to make sure that you get your funds when you need them. What about fees? According to the Terms and Conditions, “BoVegas casino doesn’t charge a fee for any withdrawal method.” So that is pretty awesome. Like many other casinos online, BoVegas has an identity verification process which is required if you want to make a withdrawal. So remember to take care of that after you register. That way you will be all ready to go when you make your first withdrawal. To get in contact with the 24/7 customer service team, you can call any of several regional phone numbers or you can open live chat. I chose to use live chat to test out the team. You already pretty much have the gist of my experience, which I mentioned earlier when I talked about finding out about the company’s background. An agent greeted me promptly and answered most of my questions quickly. The only question which she actually got stuck on was the one regarding the identity of the company operating the site. She took a few minutes to get back to me on that one, and didn’t seem to know the answer regarding regulation. Could she have done better? Maybe—it would have been nice to learn the regulatory status for certain. But I did get the impression she tried hard to find me an answer, so when she referred me to email the company for a more in-depth response, she probably was doing the best she could. Plus, I was very happy she got me the company name, especially considering that a lot of other gamblers online seem to be ignorant of it. Overall, I was satisfied. Plenty of Bonuses for whatever you’re in the mood for. 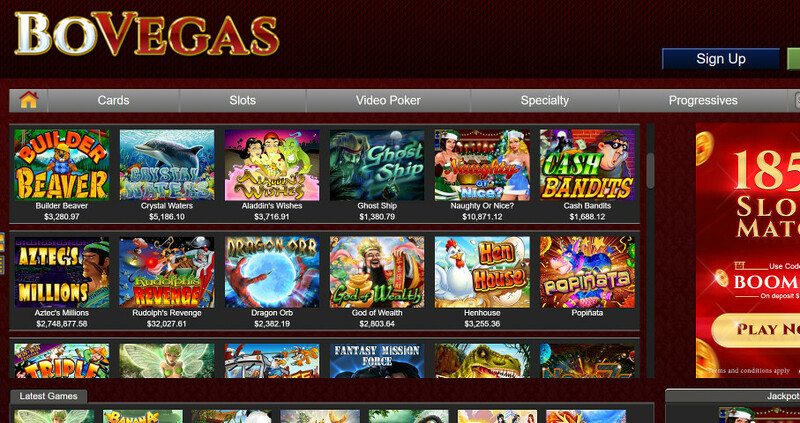 This site is powered by RTG, and includes lots of fun slot and table games. A low minimum deposit makes it easy to get started. Lots of fantastic bonuses are offered, along with a great VIP program. Customer service is responsive, friendly, and helpful. It is hard to come by information on the company which owns this site. The maximum weekly withdrawal threshold is a little on the low side, especially if you win a jackpot. Very easy sign up. Just a few questions and you’re ready to go! Provide your phone number, date of birth, and gender. Accept the terms and conditions, and consider signing up for the newsletter. This is the last screen. 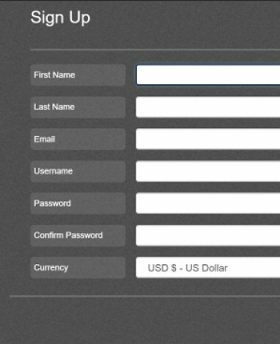 After you click “Register,” you can confirm your registration details, verify your identity, deposit your money, and start playing. Looking into the features, games, bonuses, and terms on BoVegas, I liked what I saw. I would say the single biggest drawback with this website is the lack of regulatory information available. A little more transparency would be welcome. Aside from that, I was pleased with the fee-free withdrawals, the selection of games available, the customer service, and the VIP program and promotions. So right now, I am giving them my recommendation. Want to give them a try? Click on “Play Now” on this page to sign up!